Please note that this item can be sold and shipped only to countries that require a CE Mark / either a CE Mark or a FDA approval, but not to countries that necessarily require FDA approval (like USA). The Dermalight® 80 is a mobile UV-light therapy device. It is very easy and flexible to handle due to its easy plugged and attached light-comb therapy. 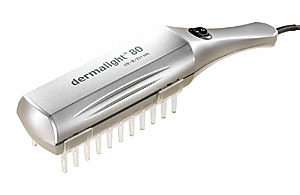 The Dermalight 80 is suitable for treatment of the body and scalp. Same price for UV-A and UV-B Bulbs. 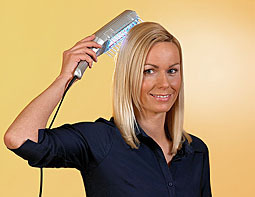 Your set includes the attachable light comb for the best results in scalp therapy. Every set contains the UV-comb, the comb attachment, the UV-protective goggles, the LCD-timer and a suitcase for shock-proof packing and storage. To view photo’s click the "DETAIL" tab in the bottom right corner of the Dermalight image. Why choose the Dermalight 80? - 4 years warranty (Bulbs are not included). - No doctor's prescription needed! Why to choose us as your supplier? - 8 weeks money back guarantee! - All prices include world-wide express delivery! - Fast delivery via express air-mail! - Every Dermalight 80 comes with a full 4 years warranty! (Bulbs are not included). - We accept Visa and Master Card! Our devices are of the highest medical quality, with added electronic safety features built into each and every device.